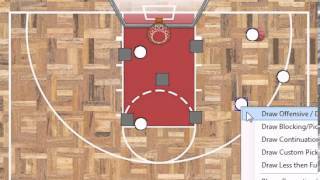 Create your Own Basketball Plays Today! We here at Youngstown Ursuline absolutely love the Basketball Play Designer. We use it to draw our own plays and display them for our players in a computer lab over a projection screen. We also use the designer to draw opponents plays and use the projection to the players as a scouting tool. There are so many great opportunities to use this device as a teaching tool to make us a much smarter and prepared high school basketball team. Thanks for the great product at a great value, it was well worth it! I bought a copy of Football Play Designer over the past off season, and it has made a huge difference in the amount of time I have to devote to playbooks. I coach a youth league team as well as a semi pro team, and my time is very limited to begin with. Football Play Designer has simplified the process of going from one team's playbook to the other. I can now rapidly design new plays, because instead of using PowerPoint and having to individually draw and place player icons, I let the Play Designer do the work for me. No more drawing individual blocking or running assignments. Since FPD is made for this purpose, I can whip right through them with a click and drag of the mouse. I only have to draw up half of my plays, because when I finish plays going to the right, I use the flip feature to design it toward the left. FPD is the best piece of coaching software that I have ever bought. My name is Mark & I am the girls varsity basketball coach at Corona del Mar High School in Newport Beach, Ca. I have used the basketball play designer to show our players visuals of our playbooks. It is much more efficient in teaching them set offenses and defenses than any other software I have seen. I use the animation on each play for the players to visualize the options for each play. This is a cool toy to enhance my coaching.